Google continues it's great run of themed 'Google Doodles', each celebrating a specific date or occassion. 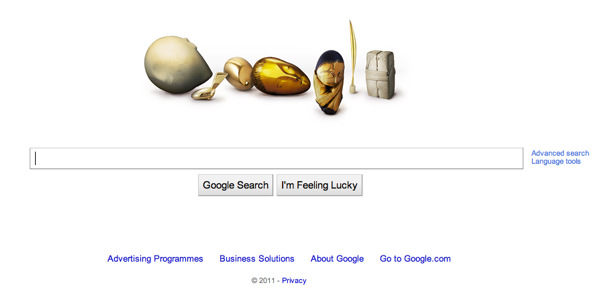 Today's graphic sees the Google logo transfored into a series of sculptures by Romanian-born artist Constantin Brâncuşi. Today marks Brâncuşi's 135th birthday and so it seems a fitting day to take a sneak peak at the sculptors life, and why he has successfully made it into the records of art history. Born in Romania in 1876, Brâncuşi proved to have a talent for sculpting from an early age where he would competently carve wooden farm tools. As he got older, he took those skills forward formally, first in Bucharest and Munich, before reaching the pinnacle of artistic schooling at the École des Beaux-Arts in Paris. In Paris, Brâncuşi honed his skills, and perfected a clean, geometric style with an astounding sense of balance and abstract symbolism. His brave style and creative artistic output in the early 20th-century has earned him the accolade of being considered one of the foremost pioneers of modernism. Interestingly, in his early days in Paris, Brâncuşi was invited to study at the studio of Auguste Rodin, a titan in the world of sculpture. After two months at the studio, Brâncuşi left, saying that "nothing can grow under big trees". Brâncuşi felt that, due to Rodin's position and stature as a sculptor, he would be less able to develop a style true to himself if he continued to work there. Brâncuşi showed a strength of character that undoubtedly allowed him to really work to define himself as an artist, instead of remaining in the shadows of his teachers. 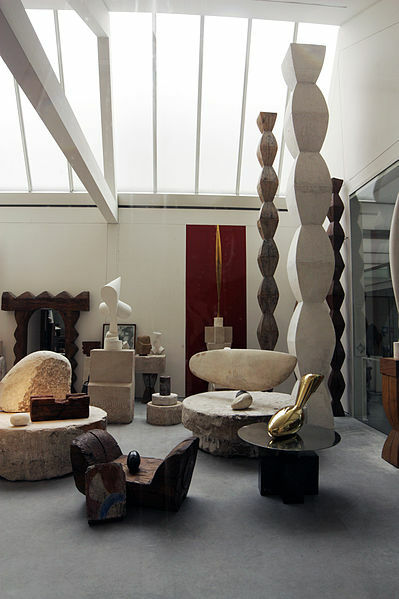 Works in Atelier Brâncuşi, Paris. Along with Rodin, Brâncuşi also spent time with Pablo Picasso, Man Ray and Henri Rousseau; a vibrant selection of artists, who no doubt helped Brâncuşi to reach his full potential and revolutionise sculpture for future generations. Brâncuşi worked with a range of materials including marble, bronze, limestone and wood, and by the time of his death in 1957 he had created more than 215 sculptures. Amongst his most famous works are Sleeping Muse (1908), The Kiss (1908), Mademoiselle Pogany (1913), Bird in Space (1919) and The Column of the Infinite (1938). At the time of his death, a large body of his work was bequeathed to the Romanian Government, however they turned it down, and it was given, instead, to the French Government. A great many of Brâncuşi's works can be seen today in museums around the world, where we can celebrate his contribution to art and art history.